The city of Paris is pulling the plug on an electric car-sharing system once hailed as the future of urban transport, with officials voting to cancel the contract in the face of mounting losses. But even after winning over some 150,000 subscribers, the system has failed to prove economically viable—despite promises by its operator, the Bollore Group, that once fully deployed it wouldn't cost a cent to the city. Socialist Paris Mayor Anne Hidalgo called the request "preposterous", and lawmakers in Paris and the suburbs participating in the scheme voted Thursday to cancel the contract immediately instead of letting it run out in 2023 as planned. "People living in urban centres have become multi-modal: they are increasingly switching from one form of transportation to another," said Nicolas Louvet of 6t, a consulting firm specialising in transport. 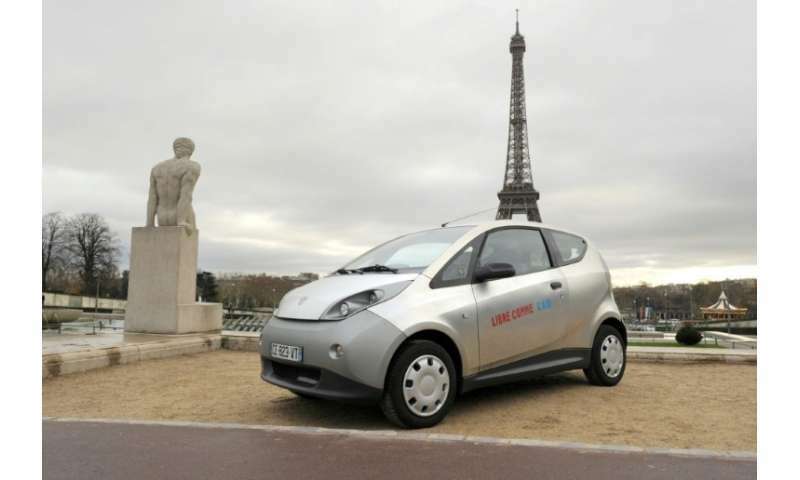 Paris has vowed to find replacement car-sharing systems, and in the meantime has said the more than 3,200 docking stations in the city will be made available to owners of electric cars. But that's cold comfort for the roughly 250 Autolib employees at risk of losing their jobs. The company's failure is the latest in a series of transportation headaches for Hidalgo, already taking heat over the bungled change of operator for the city's flagship bike-sharing system Velib, which resulted in a huge shortage of bikes. Her decision to close off major roads along the Seine river to traffic has also infuriated many drivers, who say she has simply made traffic jams worse. "There is a major problem with mobility options in Paris," the centre-right national government spokesman Benjamin Griveaux, tipped as a candidate for mayor in 2020 elections, told Radio Classique. 4.5 times a day isn't all that bad an average. I'm really surprised that they thought the cars would be used more than that. Electric bikes are a much cheaper option to use too at least when the weather is nice. It's surprisingly much, although you have to consider it is an average - some cars may be picked up dozens of times - like someone actually (ab)using the scheme to run deliveries. The main problems are that electric cars are still hugely expensive, added with the pick-up and return costs, insurance, maintenance (cleanup), and the company's own overhead because they have to pay insurance against liabilities AND make profit to pay wages and taxes, all of which makes the scheme much more expensive per car than privately owned vehicles, and that necessitates high demand to make it work. It's also vastly less energy efficient per passenger mile than simply owning the same electric car, because of the extra miles travelled to shuttle them around the city without any "payload", and all the other extra work performed to keep the operation running. That kinda makes it pointless on an environmental point of view. Any car rental has to consider the depreciation in value of the cars, because they can't lend you old beat-up cars on the point of liability and company image. Usually the cars are driven for a few years and then sold on the second hand market - but electric cars depreciate faster, they start from a higher price and have a shorter useful lifespan because of battery replacement costs, which makes their replacement cost higher. The rental company pays a larger portion of the lifespan cost of the vehicle. The company knew this perfectly well, and calculated the costs. What likely happened was the usual: they oversold the system to the city government, basically telling porkies about their estimated costs and ridership, gambling on the fact that the government wouldn't pull out once they drop the bomb and reveal the real price tag. Either way, they made a lot of money over it and the people responsible have put their golden parachutes on the ready.